The speckled rattlesnake is widely distributed throughout the Colorado and Mojave deserts and north just into the Great Basin. It is also found in the mountains and coastal-facing canyons of San Diego, Riverside and Orange cos. It occurs from 300 to 2200 m (1000 to 7300 ft) in elevation. It prefers rocky areas and slopes in a wide variety of desert and chaparral habitats, and occasionally in pine-juniper, valley-foothill woodland and conifer habitats. This snake is rarely encountered in large numbers and is probably uncommon in most habitats. It is active from mid-spring to mid-fall. Higher-elevation populations become active later in the Year (Klauber 1936, 1972, Stebbins 1954). Feeding: This snake feeds on rats Dipodomys, mice (Peromyscus, Perognathus, etc. ), ground squirrels and other small mammals, lizards (Uta stansburiana, Cnemidophorus tigris and Eumeces skiltonianus) and birds. It waits for prey to come within striking distance and also searches actively in rocky areas (Klauber 1936, 1972, Stebbins 1954). Cover: Often found in association with rocky areas, canyons, steep hillsides and other areas offering rocky cover as well as dense vegetation. Rock formations, vegetation, and mammal burrows are used for cover (Klauber 1936, 1972, Stebbins 1954). Reproduction: Young are live-born and require a quiet, safe place for birth, such as under or within rock formations, thick vegetation or in burrows. Pattern: This snake occurs in a wide variety of habitats over a wide elevational range from near the coast to desert mountain areas. It is most frequently encountered in hilly or mountainous areas that are dominated by scattered rocks or larger rock formations that provide shelter (Klauber 1936, 1972, Stebbins 1954). Activity Patterns: This snake is diurnal early in the season when temperatures are mild, and becomes progressively more nocturnal as daytime temperatures increase. It becomes active in mid-spring (later at higher elevations) and remains active until mid-fall (Klauber 1936, 1972, Stebbins 1954). Seasonal Movements/Migration: This species is not known to migrate in California, but rattlesnakes in cold climates, including some of the high-elevation populations of this species, are known to move considerable distances to winter hibernacula (Klauber 1972). Reproduction: This snake copulates in mid-spring, shortly after becoming active. The young are born in mid-summer. Litters average 4 young and range from 3-5 (Klauber 1936, 1972, Stebbins 1954). Niche: There is one report of a gray fox eating a speckled rattlesnake. It is probably taken by other mammalian predators, roadrunners, other avian predators, and kingsnakes. This snake is sympatric with several species of rattlesnakes and may compete with them for resources. Distinguishing characters: A rattlesnake with highly variable dorsal coloration- white to dark grey or shades of pink or orange; dark, diffused bands on back often split by lighter color; keeled scales; large head; salt-and-pepper speckles over entire dorsal pattern; tail with black and white bands, often incompletely encircling tail. 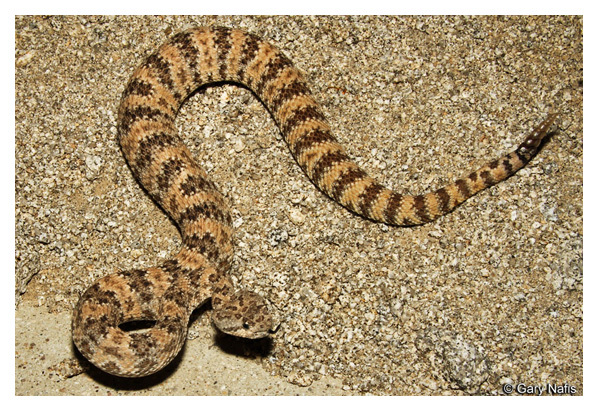 Similar species: Crotalus ruber: Has distinct diamond pattern on dorsum; black and white tail bands completely encircle tail. Crotalus viridis: Has diamond pattern on dorsum; prominent eye stripe; lacks black and white tail bands. Additional notes: An alert, nervous species most often associated with rocky hillsides and outcrops. VENOMOUS; don't handle or use extreme caution.